Current ABC/ESPN analyst and former 13-year NBA star Jalen Rose is one of the few professional athletes to maintain a high profile post retirement. Long known for his post-game quotes and great relationship with the media, Jalen continues to show his versatility in the broadcast booth, in the entertainment world and as a philanthropist. Jalen was born and raised in Detroit, Michigan, where he attended Southwestern High School and the University of Michigan. In college he was part of the legendary “Fab Five” where he and his teammates revolutionized the sport of basketball on the court and off by wearing baggy uniform shorts, black socks and black shoes. The first team in Final Four history to ever start five freshmen, they led the Wolverines to back to back NCAA Championship game appearances. In 1994, Jalen was drafted in the first round by the Denver Nuggets. Notable highlights from his thirteen-year NBA career include winning the NBA’s “Most Improved Player” and “Player of the Week” awards in 2000 and “Eastern Conference Player of the Week” accolades in 2005. As a member of the Indiana Pacers, his team appeared in three straight eastern conference finals including a trip to the NBA Finals in 2000. In 2003, he was honored with the Professional Basketball Writers Association Magic Johnson Award. Jalen was inducted into the Detroit High School Hall of Fame in 2013 and Michigan Basketball Hall of Fame in 2017. 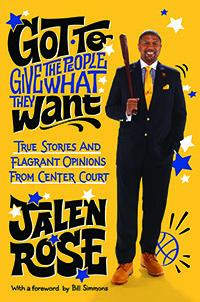 While many basketball stars make the transition to the small screen after they hang up their basketball kicks, Jalen made the bold leap in the midst of his NBA career in 2002, becoming a multi-faceted reporter for BET Mad Sports and an on-air personality for Fox Sports Net’s famed Best Damn Sports Show Period. Working with the Best Damn Sports Show Period for six years, the budding broadcast star developed his own lifestyle-oriented “Jammin’ With Jalen” segment. Shortly after retiring from basketball in 2007, Jalen – a mass communications major at U of M who ultimately earned his Bachelor of Science from the University of Maryland University College – went full throttle pursuing his passion in the multi-media, sports and entertainment world, signing with ABC/ESPN as an analyst. Covering a wide range of current events in the landscape of sports, he’s appeared on the network’s flagship shows SportsCenter, Mike and Mike in the Morning, First Take, SportsNation, Outside the Lines and Numbers Never Lie, as well as the basketball related shows Coast to Coast, NBA Tonight and College Game Day. In 2012, Jalen was named a studio analyst for NBA Countdown – ABC and ESPN’s pre-game show. On September 28, 2015, ESPN Radio launched Jalen and Jacoby, a primetime national weekday program (7 -9 p.m.) co-hosted by Rose and ESPN senior producer/commentator David Jacoby. Jalen and Jacoby, which features Rose and Jacoby breaking down the latest news in sports and pop culture, began as a passion project of the same name in 2011 and was promoted to a full show due to its popularity. On January 28, 2016, Jalen and Jacoby added a TV version of their show on ESPN2 which is comprised of segments from the radio show. Their chemistry, catchphrases and devoted following has led them to have the most downloaded sports podcast (per episode) as well as the most watched sport podcast on the internet. Recognized as one of the hardest working analysts in the business, Jalen was added to a third ESPN show when Get Up! premiered on April 2, 2018. Get Up! is an American morning sports talk television show on ESPN hosted by Jalen alongside Mike Greenberg and Michelle Beadle. The program features news, opinion and analysis from the hosts and guests and airs live weekdays from 7am-10am ET. On May 24, 2018, Jalen received the 2018 Team ESPN Commentator of the Year award for using his voice, leadership position and volunteer efforts to provide a positive impact in the community! In 2000, Jalen established the Jalen Rose Foundation/Charitable Fund to create life-changing opportunities for underserved youth through the development of unique programs and the distribution of grants to qualified nonprofit organizations. Grants focus on education and sports and are distributed in Jalen’s hometown of Detroit as well as other communities in need. A philanthropist who truly gives from the heart, Jalen has personally donated nearly $2 million via his charitable fund and to support his charter school in his hometown. The Detroit News has recognized Jalen with the prestigious Michiganian of the Year Award in recognition of his excellence, courage and philanthropy to uplift not only the metropolitan area but all of Michigan. In 2016, he was awarded the 11th Annual National Civil Rights Museum Sports Legacy Award for his significant contributions to civil and human rights, and for laying the foundation for future leaders through his career in sports in the spirit of Dr. King. In addition, the Naismith Memorial Basketball Hall of Fame awarded Jalen with the 2016 Mannie Jackson – Basketball’s Human Spirit Award. This prestigious honor is only awarded to those with this highest level of dedication to making a positive impact off the court. In 2016 and 2017, Jalen appeared on To Tell The Truth as a panelist. Hosted by Anthony Anderson, To Tell The Truth is an anarchic and funny re-imagination of the beloved, game show of the same name. He’s also appeared on Celebrity Family Feud (2016) and Celebrity Wheel of Fortune (2003). In 2017, Jalen starred in a single-cam pilot episode from writer-creator Nahnatchka Khan (Fresh Off the Boat) that aired on ESPN. Jalen vs. Everybody also starred Anna Maria Horsford, Marla Gibbs, Kelly Jenrette, Laysla de Oliveira, Jessica McKenna and Rich Sommer. It followed the former NBA star and current radio/TV personality Rose as he juggled his career responsibilities with the challenges of being a single dad. A familiar face to the big screen, Jalen has also appeared on Fresh Off The Boat and The Game, as well as made cameos in The Cookout 2, Just Wright and Barbershop.